Faringdon Tennis Club uses an online venue management system for LTA-registered Clubs called ClubSpark. ClubSpark allows members to book courts, check their membership, change their contact details, and more. 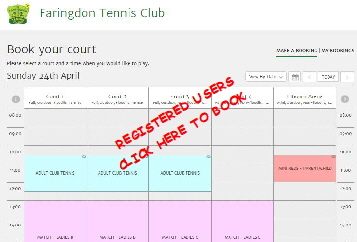 To be able to use ClubSpark, for example to book courts, you need to have a registered ClubSpark account that is linked to Faringdon Tennis Club. The only way to get such an account is to click on the link in the invitation email that we send to members. If you have not received such an invitation to join ClubSpark, then please contact the Membership Secretary . You can then also renew your membership through ClubSpark - which is very convenient. Using this special invitation, you can then choose to sign in to ClubSpark with your LTA, or Facebook, or Google or Microsoft account; or you can set up a separate ClubSpark account. You only need to register once, but you do need to remember which sign-in method you chose when registering - and then continue to use this for subsequent sign-ins. If if doubt - or if you’ve forgotten which sign-in method is associated with your registered account, please contact the Membership Secretary . The Sign-in button is top right of Court Planner. There is now also a free mobile app, called Booker, so you can quickly book courts at Faringdon Tennis Club from your phone or tablet, even when you are on the move. It is available for Apple iPhones and iPads on iTunes, or just search for “Booker” on the App Store. If your device runs Google Android then you can get the Booker app on Google Play.